You have to try and trust some people, not everyone you meet is going to hurt you. In life there are people who we will meet who will create that impact that we will carry with us for the rest of our lives. There will always be a reason why you meet new people. Either you need to change your life or you are the one that will change theirs. Next time, when love comes to you, think of it as an incoming wave, dive in and immerse yourself in it. I promise you that you will come up as a new person. 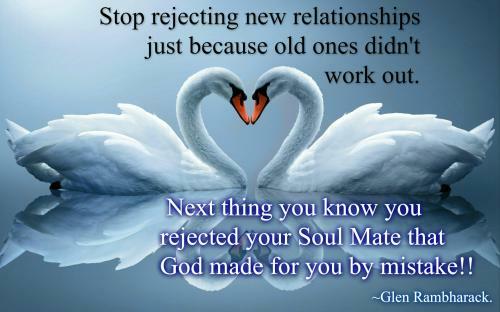 Stop rejecting new relationships just because old ones didn't work out. Next thing you know you rejected your Soul Mate that God made for you by mistake! 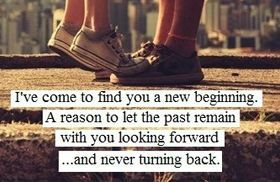 A new relationship in a person’s life can certainly be seen as a blessing. When we encounter new people and spark new relationships we are hopefully opening up new windows of the world to see out of. When we start a new relationship it is important not to be selfish about it, and not to just be in it for the benefit of yourself, but also in hopes that we may help change someone’s life for the better, while we affect them in a positive manner as well. New relationship’s will bring a change in our lives, and if we notice that this change in us is probably not for the best, it is important that we fix this new relationship as early as possible as to avoid heavy complications later on when one may be a lot more involved in said relationship. Cherish every new relationship that you are a part of, be the best relationship partner that you can be and remember that when you give someone your all you deserve nothing less than to receive their all.